Lewis Fink, Jr. was born 25 May 1850 in New York City. His father, Lewis Fink, Senior, was born 8 June 1821 in the Duchy of Hesse Darmstadt, Germany, immigrated to the U. S. in the 1840s?, and became a naturalized citizen 8 April 1862. This information is contained in passport applications filed by the Finks, Junior and Senior, May, 1867. Lewis Fink, Sr., was listed in Trow's New York City Directory in 1858. He was a dealer in provisions in business with George Hencken, Jr., at 324 Greenwich St. and 193 Duane St. Fink & Hencken were in business until around 1865. The senior Fink seems to have done well. An IRS tax assessment in 1865 taxed him the mammoth sum of $836.80, based on an an income of $10,538. The total was calculated at 5% on the first $4400 of income, and 10% on the remaining $6138. Tax was also assessed on possesstion of a watch ($1) and a piano ($2). This advertisement for Louis Fink, Jr. "sucessor to James Richards, Greenwich Iron Foundry" appeared in the Commercial Register, Trow's New York City Directory, 1876. In the previous year a similar ad appeared, where the top line read "Lewis Fink & Son." Apparently Lewis Fink, Sr., helped his son, buy the business, then a year later left it for him to run on his own. 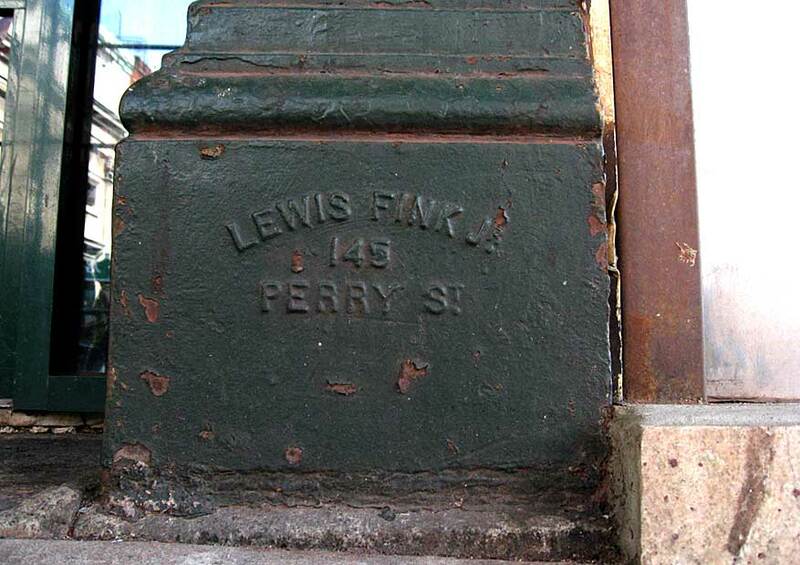 The last listing in city directories for Fink's iron foundry at 145 Perry St. was in 1881. Information on the James Richards foundry is found on the T. B. & J. Richards page. Holbrook's Essex County, New Jersey, Business Directory for 1897, indicates that Lewis Fink, Jr., at that time ran a combination of hotel, livery stable, and saloon at 300 Washington Ave., Newark, N. J. In 1900 the U. S. Census recorded Fink back in New York City (203 E. 56th St.). His occupation was given as "Manager." In the 1910 census, his widow, Catherine Fink, age 60, lived with her son, William J. Fink, in Newark, N. J.